To keep costs of Funeral Services competitive & quality of care high for families, Funeral Directors & Funeral Professionals should sign in to the e-Red Book before researching. Quick, affordable, professional courtesy care continue to be in reach with Red Book accuracy. NOTICE: The e-Red Book App is available in Android Google Play, Microsoft Store, & Apple App Store. Open your Android, Windows 10, or Apple device & go to Google Play, Microsoft Store, or App Store. Search for Red Book Funeral & install. You will need your ebook account's email & password to authenticate to your copy. Since 1936, The National Directory of Morticians provides easily accessible information formats giving more time for family care. This information is continually updated by Funeral Directors through our Red Book Agents. Red Book leads for quick research of industry specific information. The RED BOOK Funeral Home Directory works with Funeral Directors by supporting their information needs so they can better serve families at a difficult time in life. It is often necessary for a funeral director to contract with other funeral homes. Red Book helps ensure your Funeral Director finds quality, fast service at fair rates from other funeral homes by going direct to a "friendly" source for the needed work. Which helps your Funeral Director pass savings along to you. The savings vary from several hundred to thousands of dollars. A passive way to help you verify that the Funeral Director is acting in a favorable way to your needs is to ask your Funeral Director if they are using Red Book. Consider asking to see the Red Book to ensure they have one and using it. Not all Funeral Homes are the same. The majority of Funeral Homes are small business owners and very greatly in services and pricing. A fiscally consciences Funeral Director will keep your best interest in their offered services. If the Funeral Director you are considering is not keeping you in mind by ignoring professional sources, you may wish to consider contacting another licensed firm that is putting you first. "Passing it onto the family" is not consider an acceptable practice by honest Funeral Directors that truly care about you and yours. Feel free to use our Public Search to locate a firm of your choosing. The Online Funeral Home Directory (and/or Mortuary Directory) provides a complete list of licensed mortuary and funeral home establishments that work with the general public. All Funeral Homes have the ability to assist in final disposition. However, Funeral Homes differ in offerings, service, and options. We recommend for a family in need or a family in planning to take their time and ask their Funeral Director questions. Licensed Funeral Directors are bound by laws that protect all parties. You will want to ensure you are working with a licensed establishment and not a non-licensed party willing to take advantage of you. 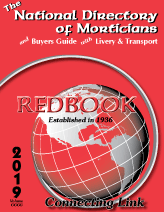 The RED BOOK printed and e-book version contain licensed funeral homes & mortuaries in the USA, Canada, Mexico, Puerto Rico, and other destinations around the world. The printed and e-book version has additional information specific to a Funeral Director's information needs. Red Book is continually updated by physical visit to each location (there is no better way to get the information correct than a face to face visit), as well as mail, phone, email, internet and fax communication. This enables Red Book to collate specific information that Funeral Directors require to assist a family in need, giving them the ability to work at peak efficiency. Funeral Directors using good information and tools provides an opportunity for better assistance to the family during difficult times. Be sure to ask your Funeral Director if they are working in your best interest. Is your Funeral Director using industry specific resources, like Red Book, designed to increase service and decrease cost? Or are they guessing. Encourage your Funeral Director to keep your interests a priority. The Online Directory (including Quick Search) has been reduced due to illegal activity. We hope to have this resolved soon. IMPORTANT: Funeral Directors need to log in before searching in order to ensure usage of specialized information.